The field of photonics is finding increasing applications across a broad range of industries. 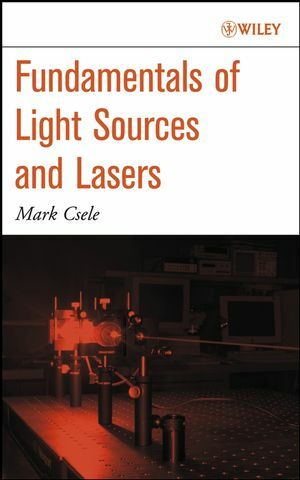 While many other books provide an overview of the subject, Fundamentals of Light Sources and Lasers closes a clear gap in the current literature by concentrating on the principles of laser operation as well as providing coverage of important concepts necessary to fully understand the principles involved. The scope of the book includes everything a professional needs to get up to speed in the field, as well as all the material necessary to serve as an excellent introductory laser course for students. Extensive real-world case studies are included to help readers appreciate the practical applications of the material covered. MARK CSELE, P.Eng, is Professor and Head of the Computer Engineering Technology Department at Niagara College. A licensed professional engineer, Professor Csele has won numerous awards for his work with lasers. He is a Member of the IEEE and OSA (Optical Society of America). 1. Light and Blackbody Emission. 5. Lasing Transitions and Gain. For instructor's resources email the editorial department at ialine@wiley.com.